Royal Dwarf by Royal Queen Seeds is an exceptional little autoflowering cannabis strain well suited to novices and those looking for an easy ride. When it comes to autoflowering cannabis, Royal Dwarf meets every expectation you could have about this type of cannabis seed. Created from the mix of Early Bud x Skunk, Royal Dwarf appears as a no-frills, easy to grow, and fast flowering auto Skunk that has managed to bag itself an award. As the name suggests, Royal Dwarf grows with a very short, compact and stocky nature. With proper training, it was even possible to grow her as a bonsai strain, making her ideal for those looking to play around with a micro-grow, or don’t have much space to work with. On average, even untrained, she only reached about 60cm in height, but it is very easy to keep her under this. Don’t let this small height fool you, though, for such a small plant, Royal Dwarf is a surprisingly vigorous strain, producing a decent yield. Depending on your skill, you can probably get around 60g per plant. While this isn’t exactly earth-shattering, Royal Dwarf was an exceptionally easy strain to grow, and went from seed to harvest in about 8 weeks. 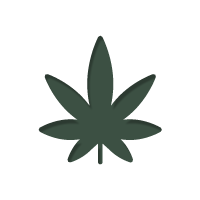 It made us feel the amount was quite reasonable, especially when you consider autoflowering cannabis can be grown all year around – meaning multiple harvests throughout the year. Having Skunk genetics gives Royal Dwarf a pungency that can easily fill a room. While this may be appreciated by the grower, neighbours and passers-by may not feel the same way. As such she is probably not well suited to highly built up areas, unless you take proper precautions. This pungent, skunky nature rides over into her smoke, which also has faint hints of diesel, and earthy pine undertones. 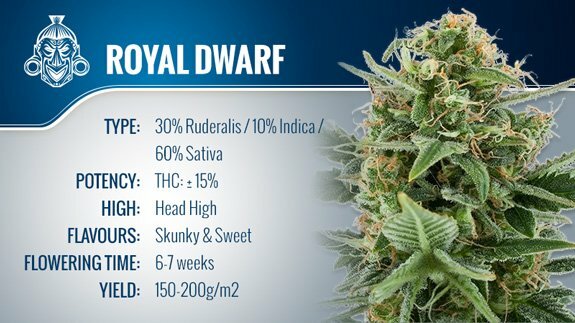 Royal Dwarf induced a pleasant, relaxing stoned effect that is strong, but not too overpowering. It makes it a great choice for relaxing with friends, opening up conversation and creating a chilled mood. On the whole, Royal Dwarf by Royal Queen Seeds has been an impressive strain to work with. She is by no means the best strain you will ever try, but the combination of her easy growth, short growing time, and comfortable smoke make her a solid choice for people looking for an everyday addition to their stash. She is a dependable autoflowering strain that can be enjoyed by all, making her a winner in our books.